The start to February trading was not as kind as January. Last week’s commentary on downside risk was very timely, as prices in the US markets were at the mercy of sellers all week. Pundits blamed bonds. Volatility returned with a vengeance on Friday. The overall uptrend remains in place, but I wouldn’t be surprised to see a switch next week. It won’t take much selling to put the indexes below their 50-day moving averages. All the market indexes fell below their 20-day moving averages for the first time in months. The Russell 2000 closed slightly below it’s 50, with the others are about halfway to that level. Price and volume action weakened substantially. 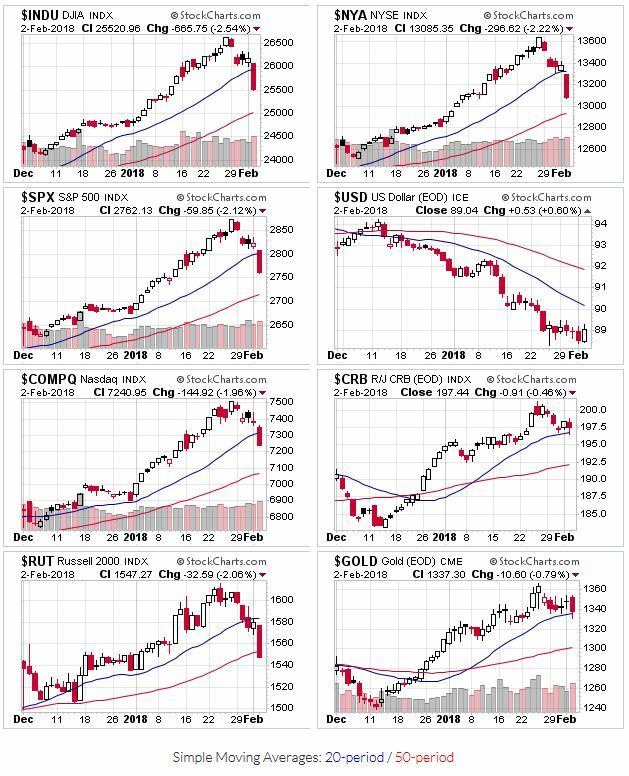 Last week was terrible for the growth stocks on my watch list; they got pummeled and had their fair share of gap downs in afterhours trading. Not the price action you see in a strong market setting. OEW indicates a downtrend may be underway, but still expects it to be small (5% or so, which would mean that we’re more than halfway there already. ).